An outfit for eating out at the restaurants of the theme park or for a late night walk. I picked kitten heels as after a long day at the park not everybody might want to slip into high heels. What would be better for a day at "The Animal Kingdom" than animal print? I paired it with a large orange bag as Kendra is a mom of three children and probably needs to carry around lots of stuff. Flats and shorts are a must for any theme park if you want to stay comfy. Kendra also told me they were going to see the Nemo musical so I chose a slightly more elegant outfit for that occasion. 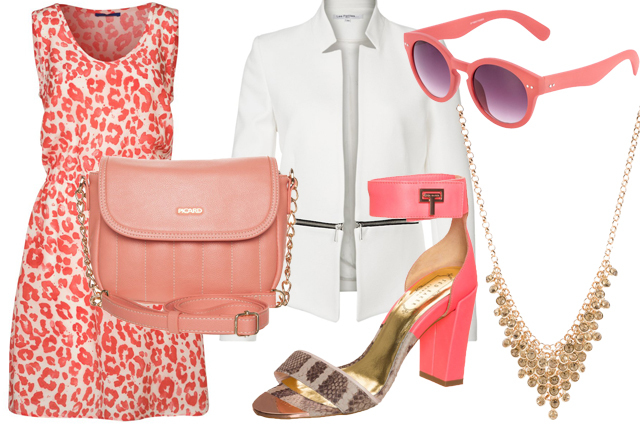 The coral accessories should perfectly match the undersea atmosphere! What do you guys think? Which outfit do you prefer and what do you wear for a day at a theme park? Ypur choices are so stylish. Love the top on the first group. This is such a fun challenge. Finding Nemo is my favourite outfit! The dress and the sunnies are really my kind of style! Hey these all look great! Love the first look. Loving all the sets! They are so perfect for spring! Carmen, you are so good at this! Do I have to pick one? I can't pick! I could really see myself wearing all three. Great pairings! All three looks are really great! If I had to choose, my favorite is the first one as it is so cool and laid back! I really love that floral print top & those earrings seem to match it perfectly! Very inspiring post! Love these outfits!